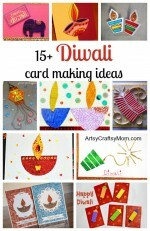 What is Diwali to you? Is Diwali the celebration heard from a distance, through the whoosh and crackle of firecrackers? 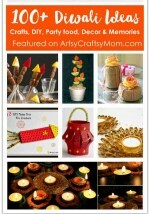 Is it the excitement in the frantic search for the perfect diya to light our homes with? Is it the fragrance of honey-dripping mithai cooking on the stove? Maybe it’s the sound of people wishing each other with a genuine hope for prosperity to fill each other’s homes and hearts? I remember helping my mom clean the house for the festival, including cupboards and drawers we’d forgotten even existed over the year. And then making mouth-watering faraal with her, cooking sweets and namkeens because it was Diwali. Oh! the smells! Of cardamom, fresh cloves, and saffron. The house smelled divine! My mouth just waters even thinking about it. So under her able guidance we made these 4 sweets for Diwali. Ghee / unsalted butter for greasing. Make sure your paneer is fresh and is at room temperature. Mash paneer coarsely and add the 2 tablespoons of dairy whitener and 1/2 tin of NESTLÉ MILKMAID Sweetened Condensed Milk in a kadhai or any thick bottom pan. Cook the mixture on medium heat with constant stirring for about 10 mins till the mixture becomes thick and starts leaving the sides of the pan. Remove from the heat and spread onto a greased plate. Sprinkle cardamom powder. 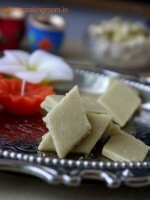 Cool ( We popped ours in the fridge for about 15 mins to rapidly cool the kalakand) and then cut into squares. Garnish with finely chopped Almonds and Pista and serve. Your Yummy Instant Kalakand is ready to be served. Works really well when you have sudden guests visiting. The whole plate was polished within minutes. Soft, gooey, melt in the mouth yumminess. These delectable white laddoos have the lightly roasted fragrance of coconuts. Its fun easy and a great dish to make together as a family. Keep aside 1/3 the desiccated coconut and add the remaining desiccated coconut powder into a thick bottomed kadhai (pan) . Slightly dry roast the coconut powder on a low flame. Take a deep breath and inhale the aroma as the coconut releases its oil. Add the NESTLÉ MILKMAID Sweetened Condensed Milk to this powder and mix well. Bring the mixture to heat, stirring constantly, so that it does not stick to the bottom of the pan. 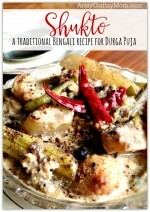 Cook on a slow flame till the mixture starts leaving the sides of the kadhai (approx 5 minutes), remove and let cool. Once the mixture has cooled enough to be rolled into balls, invite the kids over. Miss P had a blast making these round laddoos. Don’t forget to grease your palms with ghee before you roll into laddoos. Finally, roll the laddoos in the remaining desiccated coconut so that it evens covers them. This takes slightly longer than the other two recipes mentioned earlier. Miss P loves besan laddoos, especially the ones mom makes. Mom loves to hide one raisin at the center of the laddoo while rolling them and another on top. Dry roast the besan in a kadhai or thick bottomed pan on low flame for about 10-12 mins, stirring constantly. You should see the besan turning a slightly darker shade of brown. After a few minutes, the ghee and Besan should both mix well to form a dry fragrant mixture. Remove the pan from the stove and keep aside. Add 1 cup powdered sugar to this and mix well. Make sure you are holding the kadhai firmly and that it’s off the heat when you add the sugar. Mix well until the sugar starts to melt and a slightly doughy consistency is achieved. Stir well so that no lumps are formed. Once the besan laddoo mixture is mixed well, keep aside and let it cool down to room temperature. Grease your palms with ghee and roll out mini laddoos. Don’t forget to add one raisin to the center and one on top. Shankarpali is another favorite at home. Light, crunch and mildly sweet, this serves as the perfect accompaniment to tea time snacking. The whole family at the table, munching the sweet shakarpali with tea and laughter. This recipe calls for deep frying, my Ajji used to fry them in ghee in the golden days. But you could very well bake them in the oven instead of frying them. Milk – 4 table spoons. Sieve the all purpose flour to remove any lumps and impurities. Add the Semolina to this mix. Melt the ghee in a small kadhai and add to the flour-semolina-sugar mix. Knead softly until all ingredients are mixed together and the dough forms a cookie dough like consistency. Add one tbsp of the warm milk in intervals and knead to a firm tight dough. Keep aside covered for about 20-30 mins. Heat oil for deep frying in a kadhai or pan. Roll one part into a disc 6-7 inches in diameter and about a quarter an inch tall. Using a Cookie cutter or a roller, cut diamond shapes from the rolled dough. Deep fry each piece until puffy and golden brown. Place them on a kitchen tissue roll to absorb all the excess oil. Yummy, crunchy Shankarpalis are ready to be eaten. Yum. Nom Nom. 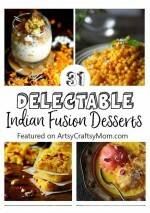 What do you think of our Diwali recipes? What did you make this year? Don’t forget to share your links and images with us. Pin the below image if you liked our post. We love it when our little post goes viral.